Lot of my Andhra friends has told me about Gutti Vankaya Koora. So one fine day I thought of trying this recipe and couldn’t get time to check the recipe from my friends. So Googled and found a quick recipe. 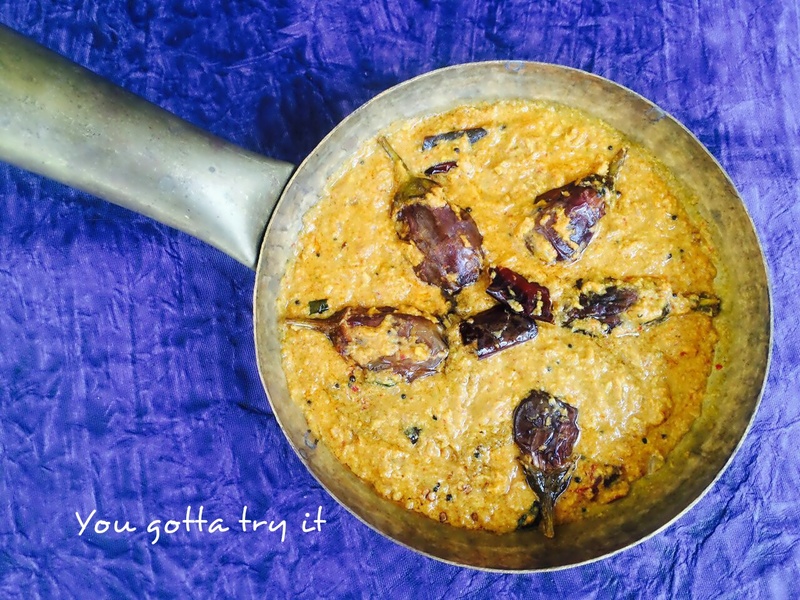 This dish is inspired by Sunitha’s Kitchen recipe for Gutti Vankaya Koora. As I didn’t make any stuffing, my recipe is more like a Vankaya (Eggplant) curry. This tangy curry is very delicious and rich in flavor. So here is the recipe for a yummy Vankaya Koora. Wash and clean the eggplants using a dry napkin or paper towel. Do not remove the stem and make 3 slits in each eggplant. In a blender, grind the dry roasted ingredients by adding grated coconut and enough water to make a paste. In a frying pan, add enough oil and fry the eggplants till it becomes soft. Heat two tbsp of oil in a pan and add the ingredients mentioned under 'for seasoning'. Once it start spluttering add the chopped onions, salt and saute well till it become brown in color. Add the ginger-garlic paste and saute till the raw smell goes away. Add turmeric powder along with the ground masala. Cook it on a low-med flame for few mins. Then add chilli powder, tamarind water and fried eggplants. Mix well and cover and cook it for 5mins or until eggplants are fully done.